Understanding Parental Alienation - Nick Woodall - family separation practitioner, writer and parental alienation specialist. Whilst parental alienation is a much more widely recognized phenomenon than it once was, it remains a controversial subject. However, what is incontrovertible is that, for some children, the dynamics around the separation of their parents is so disturbing that they respond by aligning with one and completely rejecting the other. This is not only a bewildering and frightening experience for a rejected parent, it can cause significant and lasting harm to a child. Whilst a child’s vehement rejection of a parent may appear to be fixed and rooted in something that the rejected parent has done, it is, in fact, a coping mechanism that the child unconsciously employs in order to protect themselves from the psychological dissonance that they experience as they try to make sense of the post separation world. Children who find the psychological pressures too great, as their family fractures and reorganizes, can find it impossible to maintain the warm, enduring bonds of attachment and connectedness to each of their parents. This causes them to split off half of who they are and leaves them unable to maintain a balanced experience of the world around them. For a child to reject a relationship with a loved and loving parent is the most unnatural thing for them to do. And yet, for too many families, this is a reality that accompanies divorce or separation. Left untreated, children affected by alienation face a lifetime of guilt, shame, and an inability to form stable, healthy relationships. However, children who are helped to restore balance and perspective can emerge from an alienation reaction very quickly and, with support, become happy and healthy once again. This book has been written to help you to find ways to restore your child to health and fulfil all of their potential in life. Very often, parental alienation is viewed as a parental rights issue. And, of course, parents caught in the vortex of alienation, experience huge amounts of distress and anxiety. However, we approach parental alienation from a mental health perspective. Our work, as professionals working with the problem, is about restoring children to health and about restoring parents to health. Our work is about examining the underlying dynamics that have caused the problem and then finding ways to put things right. We believe that children have a right to an unconscious experience of their childhood, by which we mean that they should be free to enjoy healthy attachment relationships, have the emotional and psychological space to be spontaneous and creative, and to explore the world around them. Parental alienation, when it strikes, causes all these things to be shut down. Children become fearful and guarded, they lose their spontaneity and creativity, and learn relationship models that are unhealthy and dysfunctional. We aim to give children back their childhood. There are many books, now, to assist professionals who wish to develop their own practice in this arena, as well as academic explorations of the phenomenon. Whilst these books are rich in clinical and theoretical content, they do not always offer parents the insights that they need to be able to deal with the problem. 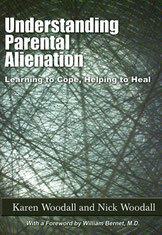 Whilst we believe that this book offers some new concepts that will add to the academic understanding of the problem and some insights that will help practitioners deal with alienation more effectively, Understanding Parental Alienation has been written specifically for parents, with the intention of putting as much power into your hands as possible. Our work at the Family Separation Clinic is built on international research and best practice from around the world. We have developed our own protocols and frameworks that are based on the evidence and that we have demonstrated, through our day-to-day work with families both inside and outside the court arena, liberate children from the problem of alienation. This book is intended to translate that theory and practice into something that you can use to help you to understand what is happening, to cope better and find practical ways that you can deal with the problem and, ultimately, learn ways to heal both yourself and your child from the damage that alienation can bring. Through exploring children’s experiences, family dynamics and transgenerational patterns of estrangement, this book will provide you with a deeper understanding of how alienation occurs and how it has manifested itself in your family. It will also provide you with practical information and tools to help you determine the best approach for dealing with the problem. And, finally, it will give you the insights you will need to heal the harm that has been caused. Ultimately, this book aims to help you to shift your perspective so that, rather than feeling that you are powerless in the face of the other parent’s actions, you experience yourself as being your child's best hope for a healthy and happy future and of having the capacity to bring about change to protect your child and restore your relationship with them. Professor Gordana Buljan Flander, Ph.D.